I got a little carried away with this dress and before I even did the 'before' shot, I took out the rather substantial shoulder pads. 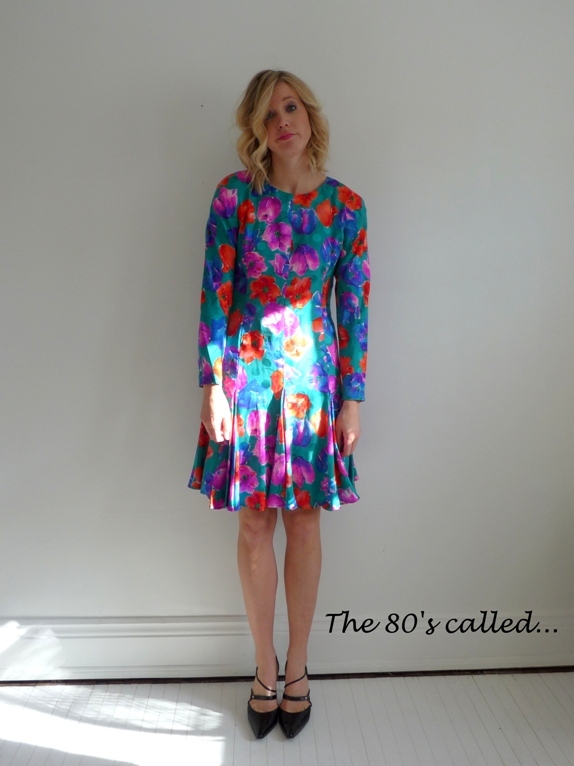 It's not even that bad of a 'before' item, it's that between the shoulder pads and the polka dot (hard to see but it's there) and floral pattern, it had a really strong 80's vibe. Mostly because it's silk. Ha. I am such a sucker for a good fabric, a high end material will always get a second look from me. The dress feels amazing and the perfect godets of fabric added to the skirt (which I remember from 1st year university take great skill to sew in so perfectly... not that I sewed them in perfectly, I was happy to get a passing mark) make it so full and swingey. The watercolour-esque floral print is cheery and pretty and I knew this dress deserved a chance. It doesn't take that much to make this dress work anyway. The removal of the shoulder pads left a bit of excess material under the arms so I could either do an alteration to the under arm or I could just roll up the sleeve to give it a slouchy look. I love long sleeves on a dress but if that dress has a lot going on, the easiest way to simplify and update the look, is to push up the sleeves. A glimpse of wrist is a beautiful thing;) I know I've mentioned this before and it's hard to explain exactly why it works but it just does. The same thing can be applied to bulky boyfriend blazers, a turned up cuff changes everything. 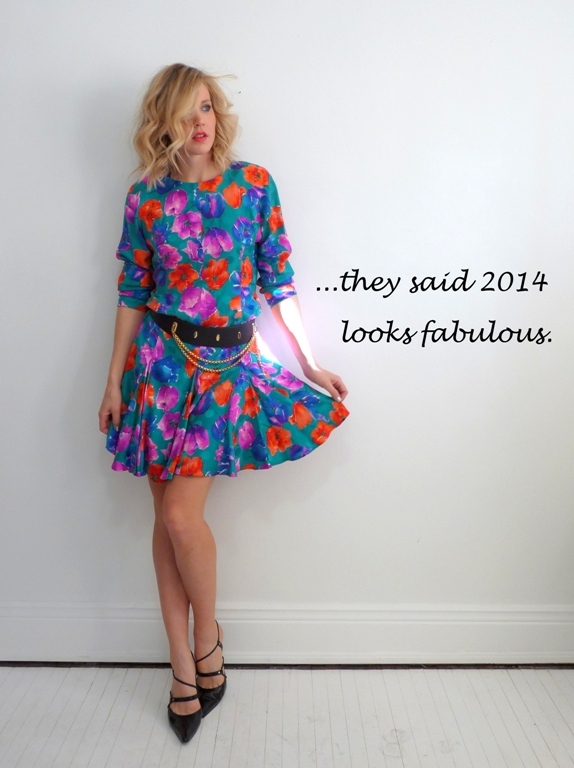 I finished the look with a big flashy vintage belt. It breaks up the pattern on the dress, defines the waist and acts as a fun contrast to all that floral sweetness. Not going to lie, I love how this turned out (vintage belt and thrifted Nine West shoes). It is only appropriate that I now start to wax on about the long awaited arrival of spring. So perfect! I love the contrast of the tough looking belt with the florals! Wow! I did not expect that transformation with no sewing! You have vision, my dear. Beautiful! LOVE the way you fabbed this up! Wow! What a fast and easy transformation! Hopefully only a month until it's springy? Maybe? i love these posts. please keep 'em coming! You look Amazing, amazing, amazing!